Lillie, Will You Please Come Forward ? Lillie Lagasse must have been close to my grandfather Léo Lagacé. Her husband Eugène Dubé was a witness to his wedding in 1912. I wonder if Lillie Lagasse Dube (1875-?) could be on this picture as well as her husband Eugene Dube (1872-?). I wonder if Lillie’s descendants would have pictures of my grandfather Léo when he was just an 11 year-old boy living in Bristol in 1900. 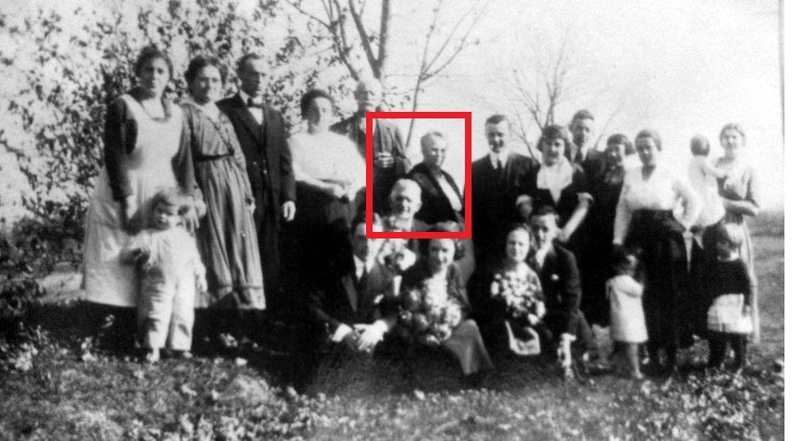 I also wonder who took this group picture around 1922. What I know about these people on it is that my great-grandfather, Dennis Lagasse II, is on it as well as his son Dennis Lagasse III. Dennis Lagasse IV is the reader who sent it a few months ago. His father Lionel had the family album. I posted most of his 100 pictures on this blog. Now looking at this picture once again more closely, I think some people on those 100 pictures could be Dubés. This group picture was taken in the fall of 1922 by looking at the trees and the leaves on the ground. I am pretty sure when it was taken because Dennis III died on October 21st, 1922. I have identified Ida Lagasse (1895-1967), daughter of Dennis III, and most probably Ida’s daughter, Jeannette Lamothe, born around 1920, holding on to her mother’s skirt. Ida married Hector Lamothe on April 23rd, 1919. Someone seems to have been just married… probably a Dubé because I am sure the newly weds are not Lagasses. But the Lagasse clan is there in full force. In the back we see my great-grandfather Dennis Lagasse II (1842-1927). His son Dennis Lagasse III (1864-1922) and his wife Amanda Ménard (1866-1955). His wife Alice Myers (1888-1958) holding Rhea Lagasse, born around 1921, with Rhea’s sister Flora Lagasse, born around 1918, in front of her. All the numbers add up, but where could Lillie be on that picture?